So, Juliet’s thirtieth birthday is on August 19. I decided to surprise her with a trip, somewhere neither of us had been before and wanted to visit, a place that would be easy to reach by air from Boston after our stay in New Hampshire. Iceland met all of these criteria, just a five-hour flight away. Of course, Juliet had to know there was going to be a trip so she could arrange for time off from work. The challenge was to keep the destination a secret from when I hatched the plan in December 2016. There were an assortment of near-giveaways, such as my announcing in conversations Juliet overheard that there would be internet, thereby eliminating a number of less-developed countries; or my naming destinations I hoped to explore, from which Juliet deduced “well, I guess we’re not going there for my birthday!” I also made the mistake of telling a lot of my friends about it, and then I couldn’t remember whom I told, and I had to remind everyone who might come into contact with Juliet anytime over the seven months beforehand not to spill the beans. But I managed to keep it from her until I had to share too much information the day before we left New Hampshire for Reykjavik. I planned to send a box home with unnecessary items of clothing. I had been watching the weather forecast for a week before our departure and knew we wouldn’t need shorts or tank tops, the maximum daily high in Reykjavik being 53 degrees. So I told Juliet to put all of that stuff in the box, and when we arrived at the IcelandAir terminal at Logan Airport the next day, her suspicions were confirmed. I asked her what her thoughts had been over the course of the many months she had known about the mystery trip and she said she had concluded we were going to go to Portugal—a baffling conclusion from my viewpoint! Iceland is a country about the size of Kentucky but with a population of only 330,000 people. It is a stable democracy, and the politics are largely progressive with little or no gender gap. The drivers of the economy are tourism and fishing. 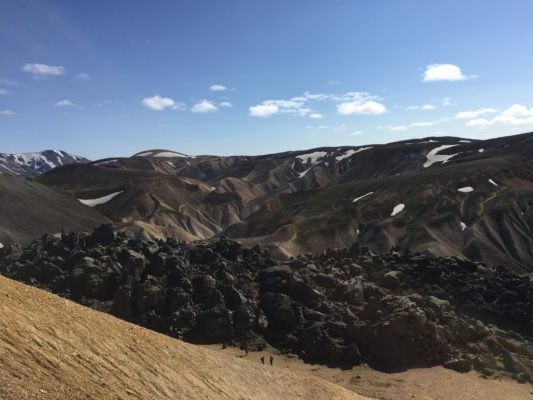 Iceland has approximately 130 volcanos, thirty of which are active. Earthquakes are common occurrences. Twelve percent of the land is covered in ice caps and glaciers, 63 percent in lava and otherworldly terrain. 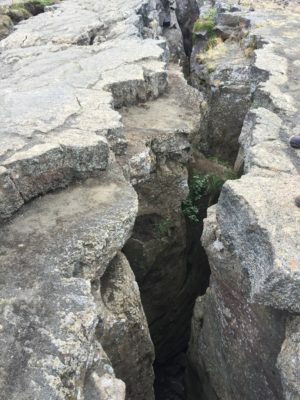 The rift between the North American and Eurasian tectonic plates is several feet wide and stretches from one end of the country to the other. Summer is like a Bay Area winter. Rains a lot; temperatures in the forties and fifties; and when there is occasional sunshine, fog crawls over the mountains as it does in San Francisco. And boy, is it windy! We bathe in hot springs. We drive over teeth-rattling dirt roads to remote parts of Iceland as well as on freshly-surfaced roads through rural farming and fishing communities. We shop for local clothing made from Icelandic wool. 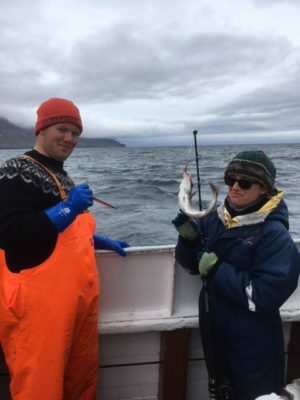 We eat herring and salmon and cod. And we enjoy the warmth and welcoming spirit of the Icelandic people. Adele, as with all your travels, I have been enjoying Iceland with you – especially Iceland for two reasons. The nephew of a friend just left for Iceland to attend the University there…I did not pay attention as to which one…perhaps there is only one. Another reason is, when I read Jared Diamond’s book, “COLLAPSE:HOW SOCIETIES CHOOSE TO FAIL OR SUCCEED” – a fascinating book all the way through but, being half Norwegian, I found most interesting how and why my stubborn Norske ancestors managed to fail so miserably there in Iceland.